Liguria has the shape of a half-moon facing the Mediterranean Sea, bordering France to the West, Tuscany to the East, and Piemonte to the North. Its coastline is lined with palm and lemon trees, castles covered in bougainvillea, and a variety of fishing villages. Vineyards and olive groves cover the steep, terraced hills that rise up from the coast, a breathtaking view. 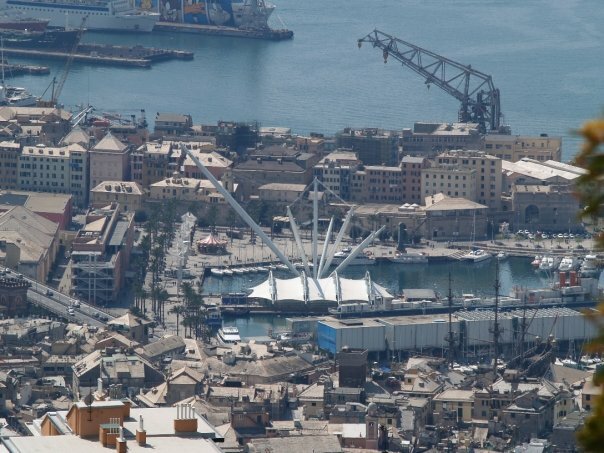 For over seven centuries Genova has been the capital of the Republic of Genova, known also as Superba. The city’s symbol is a tall lighthouse ‘la Lanterna”, her port one of the most important on the Mediterranean as well as the largest. I spent most of my life in Genova, but the first air I breathed wasn’t the salty Genovese air and I don’t have a single Genovese gene in me. Yet, I owe my professional identity as a chef to one of the most traditional Genovese foods and businesses. When I was 23 years old, I took up ownership of two Torte and Farinata stores that would have most likely been closed. Genovese people patiently wait for this thin, crispy, golden garbanzo bean flour “pancake” to emerge from the wood-burning oven so that they can savor its taste of history and tradition. It is their favorite comfort food, much more popular than pizza. It has been around for centuries, some say it dates back to the Romans who used to carry along the flour and cook it over their campfires. I had many illustrious customers, the Italian President Cossiga among them. My store“Antica Sciamadda” (Ancient Flames – it was 200 years old when I bought it) was recognized by tourist guides and publications as the place where the best farinata in town was served. The Ligurian region and Genova, and their typical tasty foods, are not well known to Americans. Except of course for the Cinqueterre, and pesto and focaccia. But there is much beyond these to be desired and explored. Genova is a city that needs to be discovered gradually. Her historical center is one of the largest in Europe. It’s easy to get lost in the web of narrow alleyways and tiny squares lined with stores, markets, ancient churches, palaces, coffee shops, and friggitorie (which perfume the air with the aroma of fried cod and fritters). If you follow the glittering light of the sea, you will find yourself at the port. There you can board a ferryboat and travel to the picturesque fishing villages that dot the coast, or travel to the islands of Corsica, Sardinia and Sicily. If you prefer to travel by land, you can hop onto the “Funicolare del Righi” and 10 minutes later find yourself on top of the steep hill from which you can admire a breathtaking view of the city and coast. Because I am so passionate about my adopted city and region, I enjoy leading tours here. I want people to get to know the beauty of Genova and experience her many unique treasures. To explore the city, discover Rembrandt and Veronese in the most unlikely places, learn how to use the right amount of marjoram in frittatas and ravioli, and select the perfect basil to make the most flavorful pesto. I take my guests on a hunt to find the best bakeries so we can enjoy focaccia hot from the oven and take in the aromatic panettone. This autumn, I will be returning to my favorite city, partnering with World Beyond Tours to lead a couple’s trip to share the best of Liguria and Piemonte with those who want to experience authentic Italian culture, tradition, food and wine. I can’t wait!